Oh What A Beautiful Morning!! I know it might sound corny but after last year's misty and rainy weather the gorgeous cloudless sky just made my heart sing! 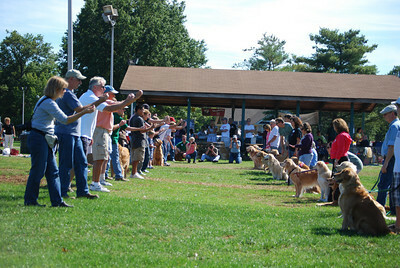 The entire day reflected the weather and a happier group of fur kids and parents could not be found anywhere. Many of our wonderful volunteers came to help set up. 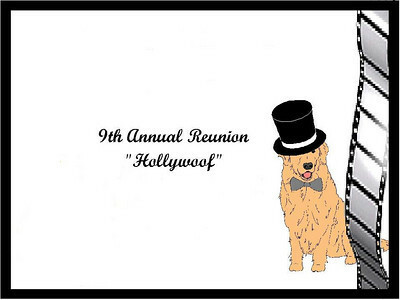 They put together an amazing party area that set the stage for our HOLLYWOOF day. 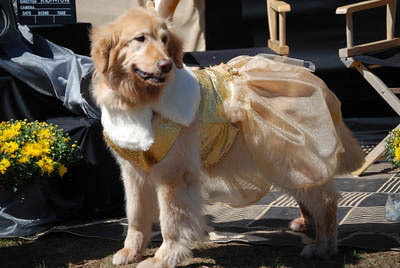 As people arrived they were greeted with smiles and doggy goody bags at our reception table. The goody bags were filled with yummy and fun items donated by our GRRI members. The Reunion began with a beautiful luncheon spread. The sandwiches were delicious. The many different types of salads, side dishes, drinks, snacks, desserts (human and dog), and paper products were all either made or bought by our volunteers. 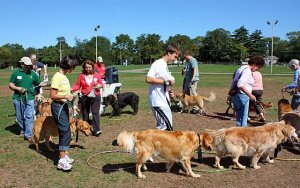 During lunch we couldn�t forget our fur kids. They were invited to an Ice Cream Social where they had yummy yogurt sundaes. 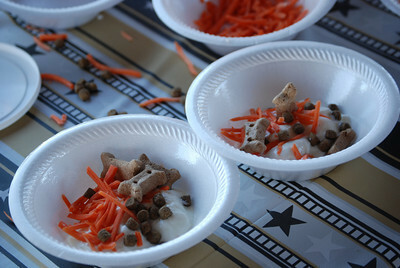 They had their choice of shredded carrots, tiny dog biscuits and kibble to embellish their treat. 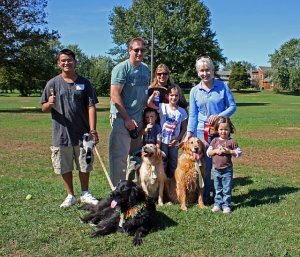 The smiles upon the faces of the dogs were priceless. 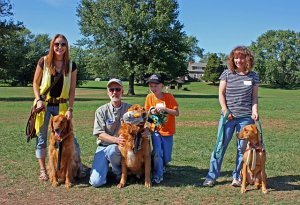 In a startling upset in the Hot Dog Toss, reigning 2-year champion, Rocky Walter, was unseated by new comer Alpine and his dad, Jim Behnke; Meg defended her 2nd place title for the second year running with the help of her mom, Barbara Brockardt. Back by popular demand, our Musical Hoops game was so well represented that we had to split it into two sessions. The winners in round one were: 1st place - Keith Kielty and Lucy; 2nd place - Sabrina Adams and Sarah, 3rd place - Erik Veiga and Morgan. 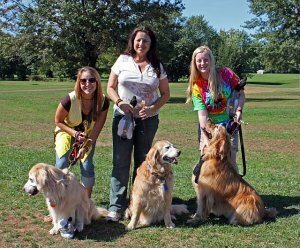 In round two, Stephanie Glazer and Daisy won 1st place; Chrissy Dragan and Rosie won 2nd and Jessica Glazer and Sammie won 3rd. A new game, the Limbo Walk, made its debut this year. 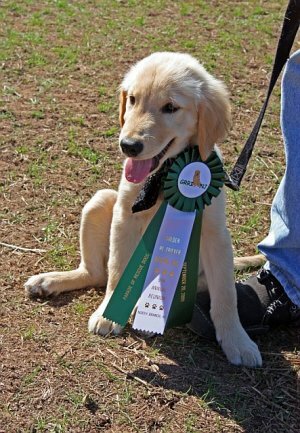 The 1st place winners were Jessica Glazer and Rascal; Jonathan Danner and Myles won 2nd place and Terry Blake and Maddie won 3rd. Guests were enticed by our GRRI store filled with golden items galore. They also had 3 tables full of eye-popping raffle items. Our volunteers out did themselves this year with the things that were donated. There is no way they can be thanked enough for their generosity. Great fun was had as we all breathlessly waited to see if our raffle ticket number was chosen by one of the children. 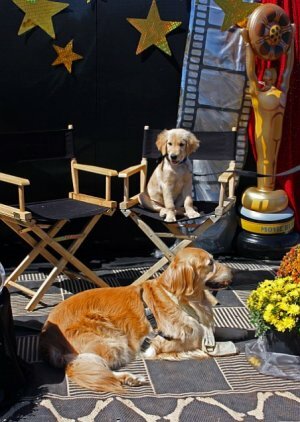 In true Hollywood fashion, we rolled out the red carpet so thirteen lucky Goldens adopted during the previous year could strut their stuff during the Parade of Rescue Dogs. Each participant received a goody bag, a Rosette ribbon and a booklet that contained all of entrant�s biographies. Special thanks to Linda Walter for organizing the parade for us. The bios can be found here. Happy human and fur faces were seen smiling on their way back to their cars. Another successful Rescue Reunion had come to an end. Of course no glorious day ends without that chore we all dread - cleaning up! Wonderful volunteers stayed to help put everything away and to make sure we left the park they way we found it. Without our volunteers, this day would not have been a success. The volunteers did everything. 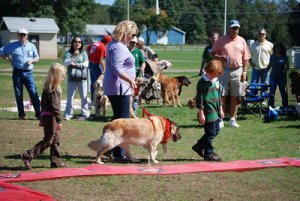 They donated items, took part in and organized such activities as the sign up table, the GRRI Store, the food tables, the raffle table, the photo booth, the Rescue Parade, and the dog games. 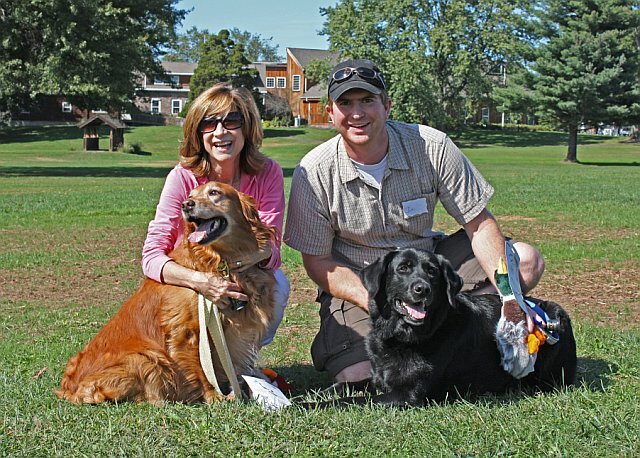 This year Eileen and I had help with the organization and carrying out of our main activities. We would like to thank our Food Coordinator, Lenise Mitchell, our Raffle Coordinator, Anne Mroz, our Dog Games Coordinator and our MC, Phil Mogerman, our Photographer, Jeanne Urna (www.PhotosbyJeanne.com), and our Store Coordinators, Rich and Linda Walter. Linda also was our Roving Photographer.